So as I find myself mid-ride on this strange crowdfunding roller coaster I ponder things. If I get the funds to continue. If I don’t. And then there is the deeper question: Why am I doing this? Why go through the obstacle course I have been treading for years to try to make this documentary? Does the world need another documentary? 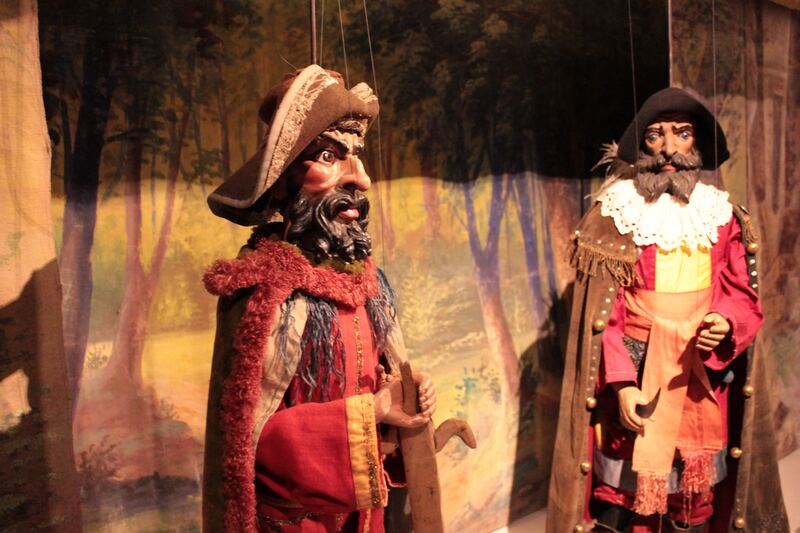 Does anyone need a serious documentary on puppetry in Europe? And given the shape of today’s technological entertainment and culture does anyone actually care? And to make a movie of puppets? Doesn’t that defeat the purpose? Aren’t I trying to communicate something to help us get out of the virtual chaos of the present? And then there folks who are going to use puppetry for exactly the wrong purposes: To indiscriminately make more cuddly cute things. To make purely visual spectacles. Or worse to add to the shrill scream of propaganda that is choking real dialogue and human contact. Why bother? 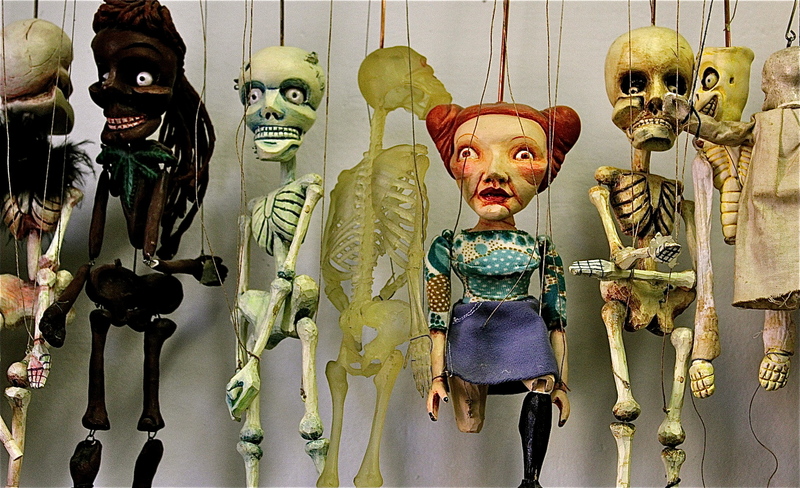 Why make a documentary about puppetry? Why make Gravity From Above? I wish I could tell you I’m just throwing these questions out there as straw men to blow over with a few optimistic clichés. I am not. Each of these questions has serious ramifications. And once the film is made I certainly can’t control how it is interpreted. I can try to include as much sanity and intelligence as is imaginable into the film. But given how things are grabbed by social networks, the media, politics, the taste makers, the trolls, commercial industry, other Procrustean forces and interpreted willy nilly, trying to throw anything against the wall of human culture these days is a potentially perilous, pointless, quite possibly ridiculous affair. And yet if we give into the regnant dominions of our day we sign up for our place on that fun slide into the Brave New World that does indeed have such people in it. So maybe there is something in the effort. Although an awful lot of effort has been made by many no doubt sincere (and insincere) people since, say, World War 2: People wanting to change the world, make a difference, revolt against the masses, épater le bourgeois, liberate desire, do their own things, follow their dreams, the list is endless. I’m not interested in any of it. 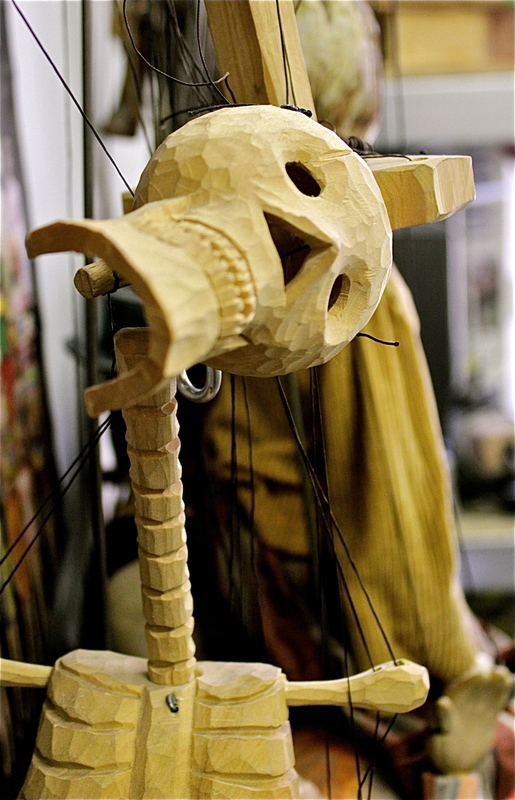 For me what I saw in puppetry originally was something humbler. And it was small. It was also something tangible, something with complex texture, something with deep historical roots, with deep wellsprings of creative possibility. 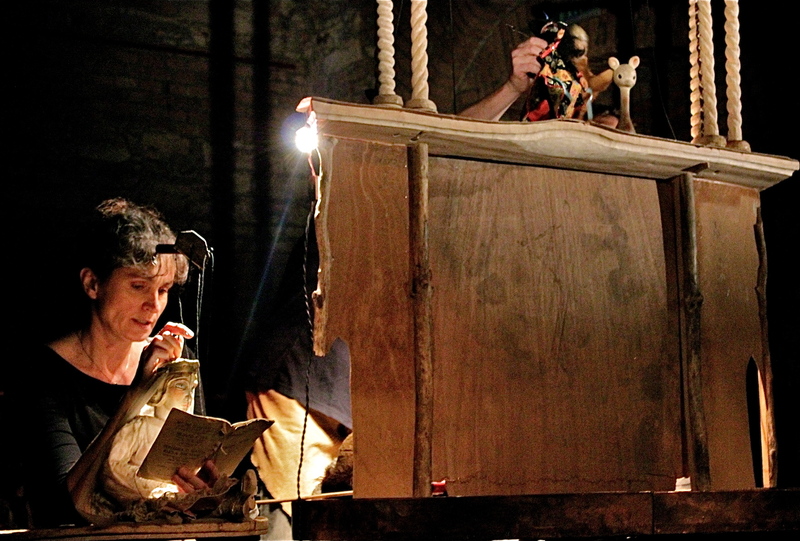 If you want to really understand puppetry go to some little dark theatre. Maybe someplace below ground level. Someplace with about 20 to 50 seats. Not a big theatrical space with all of the theatrical tropes. Something intimate. Then it really speaks. Now I want to try to impart something of that experience through a film. Can it even be done? Maybe. If I’m good. A shard of it. But then again the ultimate point of the documentary is to get you to really start ferreting a pathway out of the infestations of screenal existence that have so derailed us in this age. And that’s one thing, among many, that serious puppetry can do. (When I say ‘serious puppetry’ I include comic and children’s performances, but not all of them by a long shot, especially in the USA.) Even the animated puppet films of people like Jan Švankmajer, Ladislas Starewich or the Brothers Quay are so important for their textures in the face of a flattened graphic landscape. So then what can a documentary about puppetry do? Well first of all it can’t be the puppet show itself? If you watch Gravity From Above you won’t be able to say you’ve seen any puppet shows. But it is a finger pointing to this fascinating world that hides in plain sight. Next it can be an introduction with some historical insight and respect for what is actually a separate and complete art in itself. For puppeteers I hope the documentary will be something very different. Inspiration. Something to encourage more education and investigation. Something intellectual in the best sense of the word. For my North American friends I hope to change much of our entire image of puppetry, if that’s at all possible. Instead of seeing only Muppets, children’s entertainment, or goofy postmodernism that appropriates images of bygone children’s television shows. To rouse at least a few curious folks to the more unlimited potentials of an art that still has room to grow. And for the viewers of this film the ultimate point is to encourage them to turn off their screens for a while and to look for puppets. And if they can’t find any make some! To get back into a tangible reality with complex textures and to question the fictitious panorama that passes for 20th Century life. SO THAT IS WHY YOU SHOULD SUPPORT GRAVITY FROM ABOVE! This entry was posted on November 10, 2014 by The Anadromist. It was filed under Animation, Art, Brothers Quay, Buchty a Loutky, Czech Museum of Music, Czech Puppets, Czech Republic, Documentary, Владисла́в Старе́вич, English Puppets, European Travel, Film, France, French Puppets, Gravity From Above, Institut International de la Marionnette, Jan Svankmajer, Ladislas Starewitch, Ladislaw Starevich, Ladislaw Starevitch, Polish Puppets, Prague, Puppet Documentary, Puppet Film, Puppetry, Theatre, Władysław Starewicz and was tagged with Animation, Automata, Brothers Quay, Buchty a Loutky, Crowdfunding, Czech Puppetry, Documentary, Europe, European Travel, Film, French Puppetry, Gravity From Above, Jan Svankmajer, Ladislas Starewitch, Prague, Puppet History, Puppets. HI, I just found your blogs after watching your original video where you explained how you wanted to make the documentary (a few years ago by now.) Although you obviously are wanting the money so you can finally make your documentary, and I don’t have money to spare for your project, I DO want to tell you how grateful I am to you for all that you have done and written about the art of adult puppetry and its important role as an artform of conscience and consciousness in our asleep times. I too have been fascinated with puppetry and dolls for the past several years. Unfortunately I was not so lucky as you to have found other creative people to work with and create this kind of puppet theatre. I am still very alone in my desire to create it. But I am so glad to have found you and your blogs, and I hope very much that you will accomplish your goal of going back to Europe and making the documentary. It seems important and timely and I admire your perseverance over these last years…. you did not give up on your dream and that must mean that it has to happen eventually!! I am with you in solidarity and am interested to see where your journey takes you next. And don’t forget to keep asking for help from the spiritual world…. they obviously have a lot to do with this kind of art form, so of course they want to help you, but you must remember to ask.